The Hudson River begins its journey to the Atlantic at Lake Tear of the Clouds, a small glacial lake in the North Woods of the Adirondack Mountains. Approximately 70 miles south, the river emerges from the Adirondacks near the small village of Greenfield. It was here, on July 10, 1823, that Sanford Gifford was born. Gifford became one of the major members of the Hudson River School of landscape painters, which included Thomas Cole, Frederick Church, and John Frederick Kensett. Of this group of artists, Sanford Gifford was the only who lived much of his life in the Hudson River valley, first in the foothills of the Adirondacks, then in the town of Hudson in the Catskill Mountains downstream. Gifford, like his fellow Hudson River School artists, was a precise, almost scientific, observer of nature. In 1870, he travelled through the Rocky Mountains as an artist with the Hayden Geological Survey, one of the expeditions which mapped the American West. But Gifford spent most summers in the North Woods of the Catskills, the Adirondacks, and northern New England to paint and record a landscape beginning to be cleared and farmed. Before Gifford was born and through the first half of his life, clear trout streams drained into the Hudson River from side valleys swathed in forests of sugar maples, white pine, hemlocks, beech, birch, spruce, and fir and, in the winter, heavy snows. Most of Gifford’s early paintings, as well as many of the paintings of the Hudson River School artists, are Romantic scenes of the beauty and power of untouched Nature, especially in upstate New York and adjacent New England. The scales of most of these paintings, both their physical dimensions as well as their scenic power, are majestic; they could easily serve as the backdrop to a Wagnerian opera. The North Woods in these paintings is an idyllic wilderness, a North American utopia largely devoid of humans. When painters do include people, they invariably appear tiny to emphasize to emphasize the overwhelming power and endurance of the largely untouched mountains, rivers, and forests. One particular painting of Gifford’s, Hunter Mountain, Twilight, is different from the composition of most Hudson River School paintings. Made in 1866, the overwhelming message of this painting is the conversion of the forest by axe and plow to farmland. Most of the painting is dominated by a cutover bowl in the foreground. In it, a farmer herds his cows homeward to a barn next to a house on the opposite boundary of the clear-cut. The cows are drinking from and stepping into a small creek which meanders across and drains the bowl, muddying it as they erode its banks and bed. The painting invites the viewer to consider the hidden consequences of this erosion, such as the sediment being transported downstream and clogging the gravels in which trout eggs and fry were developing, choking the fry by obstructing their gills. America’s first generation of fly fishermen, led by Theodore Gordon, would later champion the restoration of these streams and the brook trout that was their signature species before settlers cleared the forest. In the painting, the yet-to-be-cut forest surrounding the clearing contains sugar maple, northern red oak, white and red spruce, the characteristic tree species of the North Woods. In the clearing, the stumps of these trees are cut waist high; in the left foreground, a paper birch has been felled and left to rot. In contrast to the wreckage of the forest and creek in the bowl, Hunter Mountain rises in the distant and still uncut wilderness, brooding beneath a luminous, lemon-yellow, twilight sky. Later, during the first two decades of the twentieth century, Hunter Mountain itself would be logged so heavily by the Fenwick Lumber Company that only a few patches of virgin forest would remain. Around the turn of the century, Winslow Homer would paint similar scenes of cutover forests in the Adirondacks as lumber operations worked their way upstream to the source of the Hudson River. Some of Gifford’s contemporaries thought that this painting portrayed the heroic pioneer carving a productive homestead out of the dark and dangerous wilderness. But others recognized the damage being done to the landscape by the eroding soil, the muddy stream, the eradication of the forest and the waste of good lumber in the high stumps, and by the loss of wilderness. Hunter Mountain, Twilight, embodies the period of time during which our ideas of Nature and our duty to it were as radically transfigured as the landscape itself. 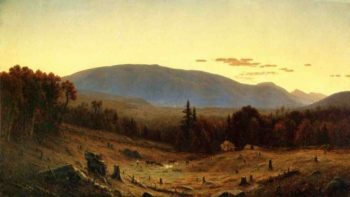 Kirk Johnson, art critic for the New York Times, says Hunter Mountain and other paintings of the North Woods by the Hudson River school became a “force for conservation”, both by idealizing the beauty and the power of the original wilderness and by illustrating the demise of it during settlement. Three of Gifford’s contemporaries – Henry David Thoreau, George Perkins Marsh, and Gifford Pinchot – stand out in the history of conservation. All three spent their formative years in the North Woods and took many of their ideas about nature from what was happening to it during the nineteenth century. And one owned Hunter Mountain, Twilight. Like Sanford Gifford and other artists of the Hudson River School, Henry David Thoreau was a precise and artistic observer of nature. In his notebooks and in The Maine Woods, Thoreau described the natural history of the North Woods with exquisite scientific and literary merit. He also made some of the first observations of how lumbering was changing the composition of the forests in Maine. The tension between virgin wilderness in Maine and the cutover and settled land along Maine’s coast and around Concord, Massachusetts, found its expression in Thoreau’s most famous sentence, written at the same time Gifford painted Hunter Mountain, “In Wildness is the preservation of the World”. But he also studied and precisely described the process of succession by which forests could reinvade cutover land through the dispersal of seeds by birds and mammals and their germination into seedlings. Thoreau in fact coined the term “succession” which continues to play a central role in ecology and conservation. Many of Thoreau’s contemporaries thought that, once cut, a forest was gone forever and then gave it no further consideration: why worry about it when an unlimited supply of timber lay beyond the next mountain, ridge, or hill, such as Hunter Mountain? Thoreau, in contrast, knew that forest succession implied that a forest was dynamic and, given a chance and perhaps some assistance, could repair itself. Armed with this knowledge he thought that we might reinfuse some wildness into a settled landscape. Thoreau also made the first quantitative study of a body of water in North America, Walden Pond. In it, Thoreau comes very close, almost frustratingly so, to the concept of a watershed. But it was left to George Perkins Marsh, a Vermonter, to crystalize the idea of a watershed as a unit of the landscape. A writer, a diplomat, a linguist, Marsh was primarily a natural historian like his contemporary Thoreau. Marsh witnessed the destruction of watersheds happening everywhere at that time in New England, much as at Hunter Mountain in New York. He saw that a watershed was not simply the river or brook that drains it, nor simply the forests which occupied its slopes, but an intimate association between the two. With this insight, Marsh established the watershed as a primary unit of land conservation. In each denuded and eroded watershed, Marsh saw a small bit of the erosion of civilization itself and issued a clarion call for the preservation and restoration of watersheds in his monumental Man and Nature. This book is an interesting combination of jeremiads against what we were doing to the land, along with optimistic calls for conservation and management of forests and streams. Man and Nature inspired New Yorkers to protect most of the North Woods in the Catskills and Adirondacks as a forest preserve. Enshrined in the state constitution as a place “forever wild,” the Adirondacks and Catskills even today deliver water to the Hudson River for the residents of New York City. Sanford Gifford’s friend, lumber baron James Pinchot, named his son Gifford after the painter. Sanford also became the boy’s godfather. The sketches for Hunter Mountain were begun in 1865, the year that Gifford Pinchot was born, and the finished painting was purchased the following year by James Pinchot, Gifford Pinchot’s father. James Pinchot made his fortune by extracting timber from the North Woods but later in life realized a self-conversion to conservation and forestry. Hunter Mountain, Twilight hung in prominent places in the homes of James and later Gifford Pinchot in New York City: above the living room fireplace in 1615 Rhode Island Avenue in Washington DC, Gifford Pinchot’s home during his years as Chief Forester for the U.S. Forest Service, and until 1960 at Grey Towers, the family compound in Milford in northeastern Pennsylvania. The continuous presence of the painting in prominent places in the family homes must have reminded father and son what we were doing to the American landscape; perhaps more importantly, it implicitly asked how we would change course. Marsh’s Man and Nature also figured prominently in the thinking of both father James and son Gifford. Amos Pinchot, Gifford’s younger brother and later colleague in spreading the message of conservation, gave Gifford a copy of Man and Nature for his 21st birthday. Shortly thereafter, following Gifford’s graduation from Yale, father James bankrolled him on an educational trip to Germany and France to learn European techniques of forest management. On this trip, Pinchot realized that European methods of single-species plantation forestry would never do to repair the American forested landscape and manage forests sustainably for both profit and repair of watersheds. Instead, he realized that sustainable forestry and conservation in America needed to be based on knowledge of the natural history of American trees and forests, a discipline Thoreau had begun in his notebooks. Accordingly, after he returned home, he secured a contract from the Phelps Dodge Timber Company to make the first detailed study of the natural history and management of an American tree species, The Adirondack Spruce. This book became the foundation of the development of American silvics, the study of the biology and natural history of tree species with an eye towards sustaining their populations while at the same time extracting resources from the forests they compose. Later, after Pinchot founded the U.S. Forest Service under the presidency of Theodore Roosevelt (who began to develop his own ideas of conservation while moose hunting in the Adirondacks), he established the network of experimental forests and watersheds which continue to be maintained by the Forest Service today. In one of these, the Hubbard Brook Experimental Forest in the White Mountain National Forest in New Hampshire, we are finally learning how forests control the quantity and quality of water draining them; in short, we are learning how watersheds work. Pinchot’s knowledge of how to manage tree species renewably and sustainably in order to protect watersheds and deliver timber put him in opposition to others who put more emphasis on preservation rather than management, taking their credo from Thoreau’s famous sentence. Pinchot’s first-hand knowledge of the conditions and natural history of the Adirondacks put him in opposition to New York’s Forest Preserve. Pinchot believed with an almost religious conviction that conservation entailed scientifically sound management of the land “for the greatest good for the greatest number” while preservation would never fully achieve its aims. But as in the early development of all new ways of thinking, contradictions abounded both within and among all three men. Thoreau may have said that wildness is the preservation of the world, and in one trip to Maine, he wrote, “who shall describe the inexpressible tenderness and immortal life of the grim forest, where Nature…is ever in her spring, where the moss-grown and decaying trees are not old but seem to enjoy a perpetual youth?” But on the same trip, he described the North Woods wilderness of Mt. Katahdin as “vast and drear and inhuman”. Despite his fascination with wilderness, Thoreau made his living not as an author but as a surveyor, platting out homesteads in central and western Massachusetts at the edge of the North Woods where owners would convert their woods to scenes much like Hunter Mountain. Yet, out of his surveying of land purchases came the opportunity to record many hundred pages of natural history observations as well as the skill to create a bathymetric map of Walden and its surroundings and to interpret what his data could tell us for the movement of water into and out of Walden Pond. Marsh is sometimes derided for his technological and managerial fixes to degraded watersheds, but Marsh also took the remaining untouched wilderness watersheds in Vermont to be the benchmarks of managerial success. Pinchot may have thought that preservation of remaining wilderness would do nothing to restore the forests and watersheds wrecked by the unregulated axe, but he enjoyed camping trips into the untouched North Woods of the Adirondacks; his father James taught him to fly-fish in the brook trout streams draining the North Woods of the Catskills and Adirondacks, a skill and devotion he retained to the end of his life. In his essay, “Time is Like an Ever Rolling Stream”, Pinchot wrote “Men may come and men may go, but the Sawkill brook flows on – feeding its trout, protecting its insect, molluscan, and crustacean life – a home … for myriads of living creatures – a thing of beauty and a joy forever. Along its banks, giant pines and hemlocks have germinated and grown, flourished and died, decayed and vanished, uncounted generations of them, each having its contribution to the richness and glory of the place.” There is no better description of an ecosystem or a watershed or untouched wilderness or, for that matter, the North Woods, which Pinchot obviously loved as much as he loved and promoted scientific forestry. One of the supreme ironies of Pinchot’s opposition to preservation is that the value of wilderness to sustainable management of the land was demonstrated first in the Boundary Waters Canoe Area Wilderness in the Superior National Forest in northern Minnesota. Although it was not designated wilderness until the Wilderness Act of 1964, the Boundary Waters was recognized as a special sector of the Superior National Forest from its establishment in 1905, and large sections of it remained uncut right up to its official designation as wilderness. While exploring the Boundary Waters by canoe, Bud Heinselman, a forest ecologist employed by Pinchot’s agency, would learn how the North Woods depended on fire to rejuvenate itself. Heinselman’s research would not only help establish fire as a conservation tool, but also challenge the Smokey the Bear fire control management strategy of the Forest Service itself. With Heinselman’s pioneering research, wilderness became, in Aldo Leopold’s words, a “land laboratory” for discovering how nature works so that management outside of wilderness areas would be more scientific and sustainable. This was Pinchot’s bedrock goal of conservation in the first place. These same tensions between preserving wild landscapes and the need to extract resources from the land for the good of everyone remain with us today. Does a watershed have to be completely wild to deliver a steady supply of fresh, clean water or can we harvest timber and other resources without affecting the flow and chemical purification of the water that drains through it? Should we conserve species because they have an inherent right to exist or should we concentrate on sustaining “ecosystem services” to us humans? Can wilderness be managed at all? Is there any wilderness left which truly remains “untrammeled by man” even as pollutants are spread world-wide by the winds and climate change happens globally? Perhaps it is best not to see these different views encompassed by Thoreau, Marsh, and Pinchot as contradictions but as a rich and complex response to the beauty of the landscape and our responsibilities towards it while at the same time we extract resources from it. We have not yet answered the questions which Thoreau, Marsh, and Pinchot raised as they established the foundation of conservation in North America. The important point is that they did raise them and the landscape that inspired them was the North Woods.